The greatest culinary battle in the world began today with the official Parade of Nations, attended by over 2 000 chefs, in Erfurt, Germany. Among the 59 nations represented in the impressive parade of men and women in white were the eight-strong South African National Culinary Team and the seven-member Junior Culinary Team. Carrying the flag for South Africa, the teams will participate in two gruelling competition categories each over the next four days in their bid for gold, silver and bronze medals. First held in Frankfurt in 1900, the IKA Culinary Olympics takes place every four years in Germany. In 1980 South Africa competed for the first time, making 2016 the tenth anniversary of South Africa’s participation. For the 32 nations competing in the Culinary Olympics, the two categories of the competition – the Culinary Art or Cold Table display and the Restaurant of Nations or Hot Kitchen, test the limits of their creativity, endurance, talent and skill. South Africa will be competing tomorrow in the Culinary Art category, which will see them presenting 92 individual items, each a work of art painstakingly crafted with absolute precision and accuracy and coated in aspic, a gelatine-like substance, to preserve and finish off each dish. Teams are judged on presentation and innovation, composition, correct professional preparation and serving arrangement, each of which carries a potential 25 points, to reach a total out of 100. The international jury of esteemed judges deliberate before the display is opened to thousands of members of the public, and results are announced at the end of the day. The second component of the competition, the Restaurant of Nations, requires the presentation of a three-course menu to 110 members of the public, from which plates are randomly served to judges. South Africa will be competing in this category on Monday 24 October. “This Team is one that South Africa can be proud to have representing us on the global stage. 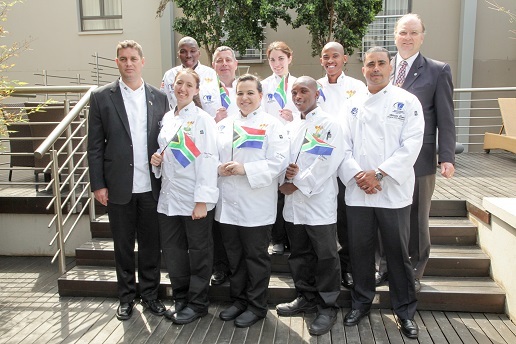 They have practiced their dishes to perfection over the last two years in preparation for this day, and no matter what the end result, they are winners,” says Heinz Brunner, Manager of Culinary Team South Africa. 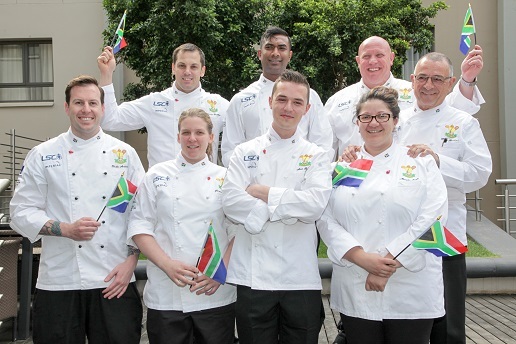 The South African National Culinary Team will be participating in the IKA Culinary Olympics under the auspices of the South African Chefs Association. The team’s participation has been made possible through the generous sponsorship of headline sponsor LSC/Imperial; along with partners City Lodge Hotel Group – which provides accommodation for the team when they travel to practices, ChefWorks – which provides the team’s entire uniform range including casual wear, Turn ‘n Slice – which provides all the fruit and vegetables used for the practices and dinners, Global Knives – which ensures the chefs are properly equipped in terms of knives, and N1 Restaurant Suppliers – which provides the Springbok meat for all Hot Kitchen practices and promotional lunches/dinners over the two years of practice and preparation ahead of the IKA Culinary Olympics. SACA President, Stephen Billingham had this to say: “Both our Senior and Junior team members never claimed to be the best chefs in the country, however these talented individuals are no doubt the most dedicated and committed chefs in the country. The ladies and gentlemen of Culinary Team South Africa are not remunerated for their hard work and dedication and sadly some often have to pay for their own ingredients and transport and chip into their leave to attend their practices. This noble team is recognised under the official Masakhane emblem (which means let's build each other). We are proud to be associated with these chefs."